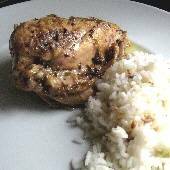 This is my favorite recipe for oregano chicken. It involves three steps: brining, browning, and boiling, and is worth every minute of prep time. The resulting chicken – stewed with onion, lemon juice, olive oil, and plenty of oregano, is delicious and falling-off-the-bone tender. This recipe consists of three steps: brining, browning, and boiling. Dissolve a handful of sea salt in a large bowl or pot of cold water and submerge chicken pieces. (Make sure water covers the chicken.) Let soak for 4 hours. Drain chicken and remove skin and heavy deposits of yellow fat. 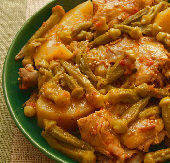 Heat 4-5 tablespoons of olive oil in a skillet over medium-high heat and brown the chicken lightly on all sides. Transfer browned chicken to a soup pot or dutch oven. Add quartered onion, 3/4 cup of olive oil, 1 heaping tablespoon of crushed dried oregano, 5 ounces (150ml) of lemon juice, and enough water to cover. If desired, add 1 teaspoon of sea salt. Bring to a boil over high heat, reduce heat to medium-high and continue to cook, uncovered, for about 1 hour and 30 minutes, until about 1/2 inch of liquid remains in the bottom of the pot. Toward the end of cooking, run a spatula or spoon under the chicken pieces to keep from sticking to the bottom of the pot. Serving suggestions: Serve with your starch of choice (rice, potatoes, pasta), and spoon the liquid from the pot over the top. A good crusty bread to sop up the juices… fabulous!